Testing is not just about analyzing for traces of cannabinoids or terpenes. It’s just as much about determining a plant’s strain type. Most people with a basic familiarity of marijuana know the plant is categorized mainly into two strains: sativa and indica. Nowadays, due to years of crossbreeding by growers, most strains are hardly purely one or the other. Learn more about hybrid strains and why they are part of the key to effective medical cannabis usage. Hybrid strain analysis is one of the many facets we test for at Modern Canna. First-time cannabis users are often overwhelmed when selecting a cannabis type. Their options are typically sativa, indica, or a hybrid. With hybrids, the choices branch into countless other subcategories that depend on whether the species is sativa-dominant and indica-dominant. Hybrid cannabis plants are no different than hybrid grapes or hybrid hops for making beer. The purpose of crossbreeding and producing hybrids is to create a strain that offers a balanced benefit of both sativa and indica. To date, breeders have catalogued a total of 779 cannabis strains, about half of which are hybrids. As crossbreeding becomes more sophisticated, more growers are even creating sub-hybrids by crossbreeding two existing hybrid species. An example of this is a strain called Blue Dream; it’s a crossbreed between a sativa-dominant species called Haze and an indica-dominant hybrid called Blueberry. Not all cannabis strains have the same effect on the human physiology. Sativa, for example, produces an energetic high and is recommended for daytime use. Indica, on the other hand, is more known for its sedative-like qualities and is used for patients trying to rest or go to sleep. Instead of an effect that leans all the way on one end, hybrids produce an effect somewhere in the grey area that affects the body and mind in different ways. Hybrids have a different terpene content compared to their pure sativa and indica counterparts. In turn, these terpenes affect the effects of cannabinoids, especially the psychoactive compound THC. Due to the legal status of THC, breeders may create indica-dominant hybrids (which tends to have higher THC than sativa) that have the same terpenes but with lesser of the psychoactive compound. Desirable traits in a hybrid go beyond their effects on human consumption. Growers also grow hybrids that exhibit high resistance to disease and pesticides. Other desirable traits beneficial to growers include the ability to produce a higher yield, hardiness, and resin content. We mentioned earlier that cannabis hybrids can be either sativa-dominant or indica-dominant. One popular sativa-dominant hybrid goes by the name Lemon Haze and has a caffeine-like effect. By contrast, there’s an indica-dominant hybrid called Cookies, which is not unlike a pure indica plant with relaxant qualities. Sativa-dominant species tend to produce a “head high” sensation with a mild body high, while indica-dominants do the opposite. There are even hybrids with an even or near-even 50/50 split. These are known as true hybrids. It’s difficult to say who should use a hybrid strain since everyone’s body chemistry responds differently. Hybrids may be a great option for someone seeking a nice balance of energy and calm. Some users may also gravitate towards hybrids after finding their body reacts too strongly to a pure strain. Hybrids are also increasing in demand as marijuana education becomes more commonplace. More people are aware of the diverse cannabinoid profile of various hybrids, which increases the supply of demand chain that begins with the growers and cultivators. This is all the more reason cannabis sample testing is vital. This way, you can determine if a seemingly sativa-dominant plant turns out to be indica-dominant or vice versa. Likewise, if distributing a true hybrid, tests will show whether the plant’s chemotype truly yields a 50/50 split. Like pure sativa and indica strains, hybrid species have their own specific cannabinoid and terpene profile. We can test for these constituents to verify whether a strain is indeed of a particular species. This is done through state-of-the-art testing equipment like mass spectrometry, flame ionized detection, and high-pressure chromatography. The marijuana industry is evolving. It’s also becoming more competitive as growers continue to experiment with different crossbreeds that contain the best elements of sativa and indica. 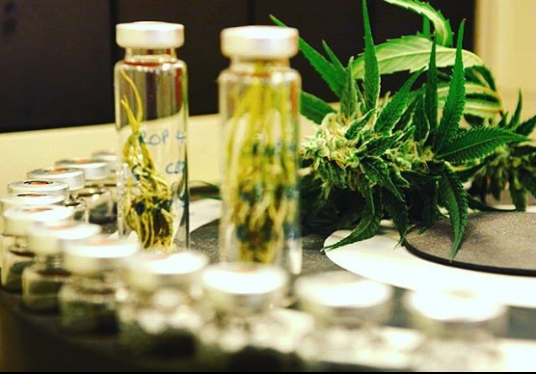 We recommend that cultivators submit samples of their breeds to a Florida marijuana analysis lab like Modern Canna. We can determine the cannabinoid and terpene profile to verify its hybrid classification (i.e. sativa-dominant vs indica-dominant).